The Sooners defeated the Roadrunners and advanced to the second round where they will face VCU in Oklahoma City. For more than a few minutes there, No. 2 Oklahoma looked like it was going to pull a Michigan State. They started the game down 8–0 to No. 15 Cal State Bakersfield. And at 14:45 left in the second half, the game was tied. But they didn’t let the Road Runners control the game, like the Spartans did earlier in the day against Middle Tennessee State, and went on a late 8–0 run to seal the 82–68 win and advance to the second round of the West region. It helps to have senior guard Buddy Hield. The player of the year candidate scored 27 points, his 17th game this year with 25 or more points. He also had four rebounds. The Sooners also got 16 points from senior guard Isaiah Cousins, who shot 3-of-3 from distance. For the Road Runners, senior center Aly Ahmed led the upset push with 16 points and eight rebounds. With the field seemingly more wide open, Oklahoma reminded us why it’s a national contender. 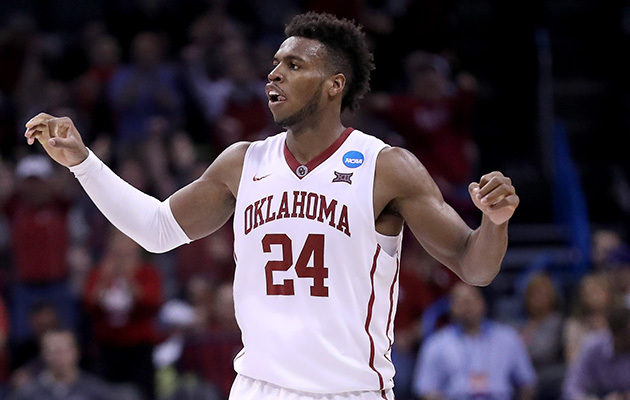 Where Michigan State faltered, the Sooners allowed Player of the Year candidate Hield to take over. Now that Michigan State and Denzel Valentine are out, Hield is the best player in the tournament. With their high-octane offense, above-average defense and resilience shown in the win, Oklahoma might be the No. 2 seed with the best chance to win it all. On Sunday in Oklahoma City, Oklahoma will take on No. 10 VCU. The Rams beat No. 7 Oregon State earlier Friday 75–67.